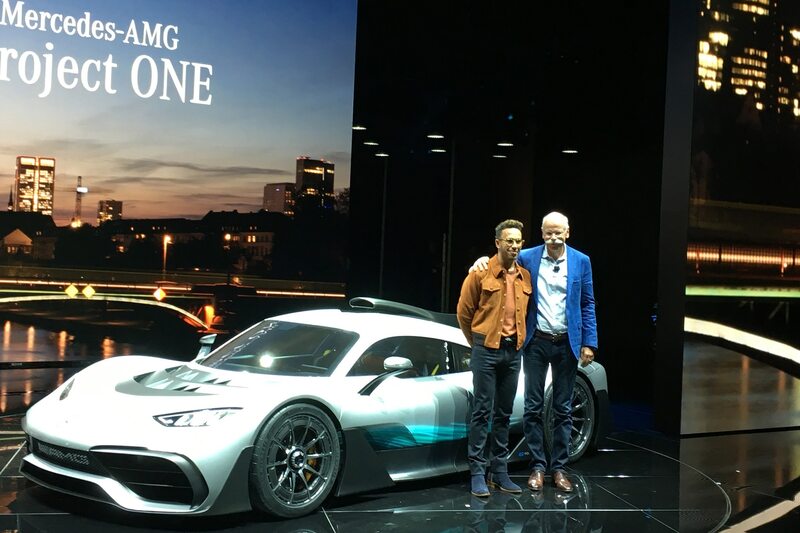 FRANKFURT, Germany – Mercedes-AMG is celebrating three consecutive years of Formula 1 Manufacturers World Championships (and corresponding drivers’ championships for Lewis Hamilton, twice, and Nico Rosberg) with a car aimed at the heart of Bugatti, a marque that hasn’t competed in Grand Prix since the 1930s. 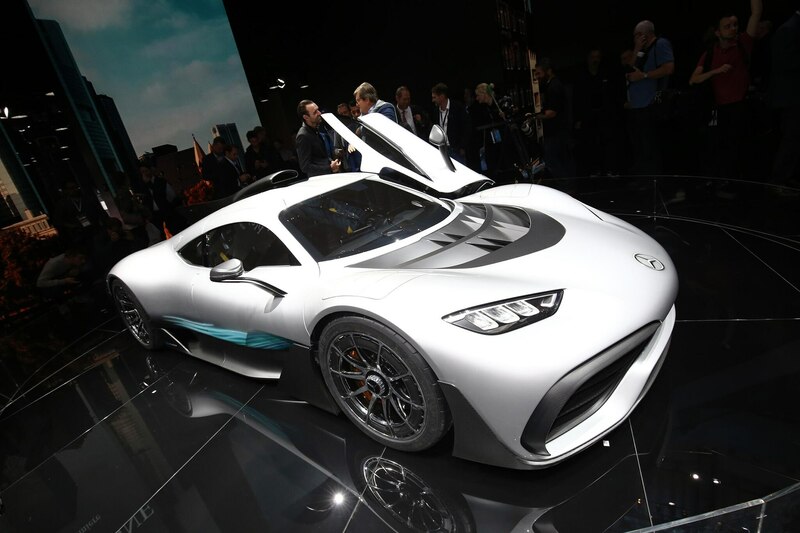 By the time the Mercedes-AMG Project One is delivered to such lucky customers as Hamilton, who is likely to get a big break on the $2.53-million price, the Mercedes-AMG team may have its fourth consecutive Manufacturers Championship. 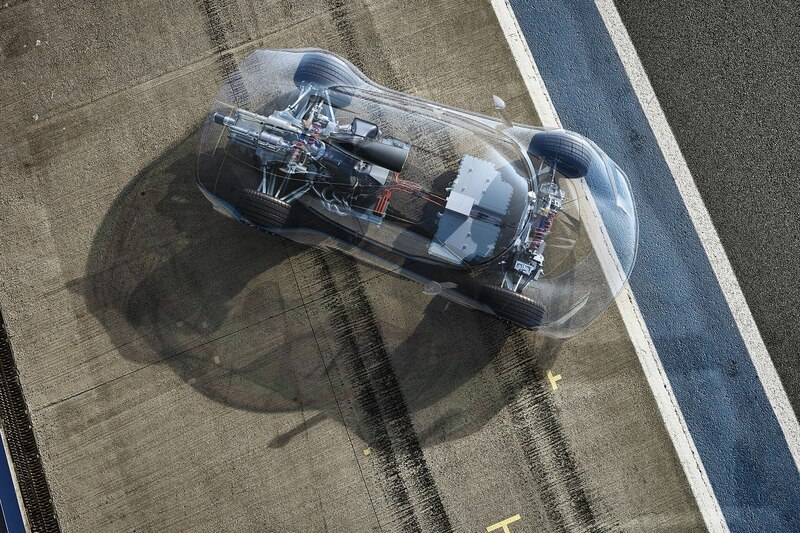 While Volkswagen Group’s Bugatti Chiron gets its 1,479 horsepower from a relatively conventional quad-turbocharged W-16, the Project One’s 1,000-plus horsepower comes directly from the racetrack, apparently making it a, well, road-legal F1 car to Bugatti’s road-legal NHRA top fuel dragster. 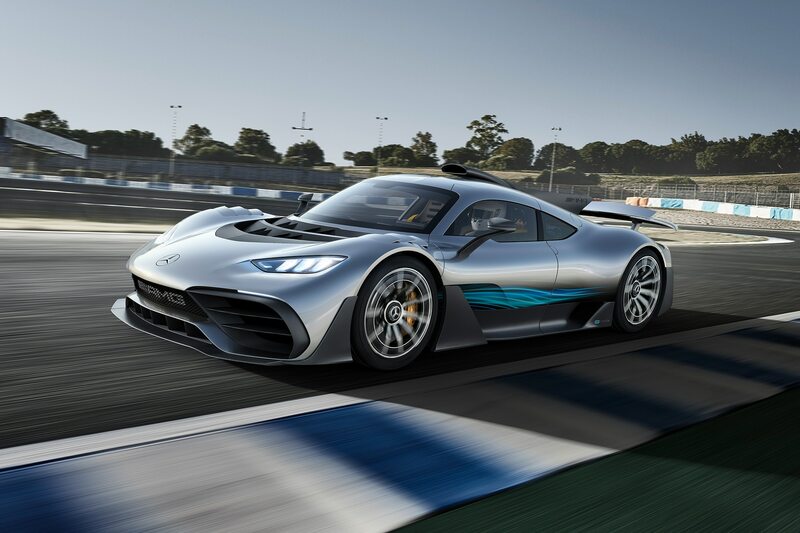 Mercedes-AMG says the Project One is the first road car with an unbridled F1 engine under its hood. That engine is a 1.6-liter turbocharged V-6 with an electric turbo and another electric motor connected to the crankshaft. Not to F1 spec, two extra electric motors that power the front wheels. It has all-wheel-drive with torque-vectoring, and puts its power through an eight-speed automatic transmission with paddle shifters for its only forward-gear controls. By now you’re asking yourself, “self, should I buy one?” Here’s what you need to know before you decide to write a six-figure deposit check. 1. 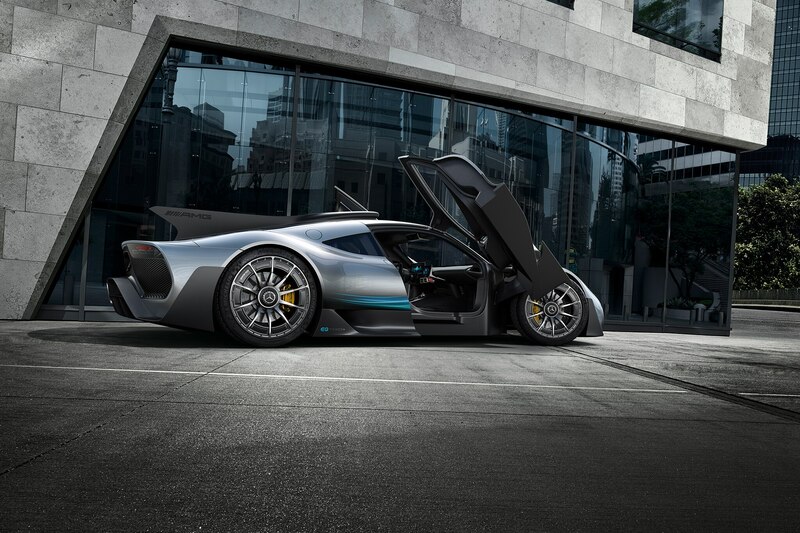 With “just” 1,000 horsepower, the Mercedes-AMG Project One will not be the quickest, most-powerful hypercar extant. 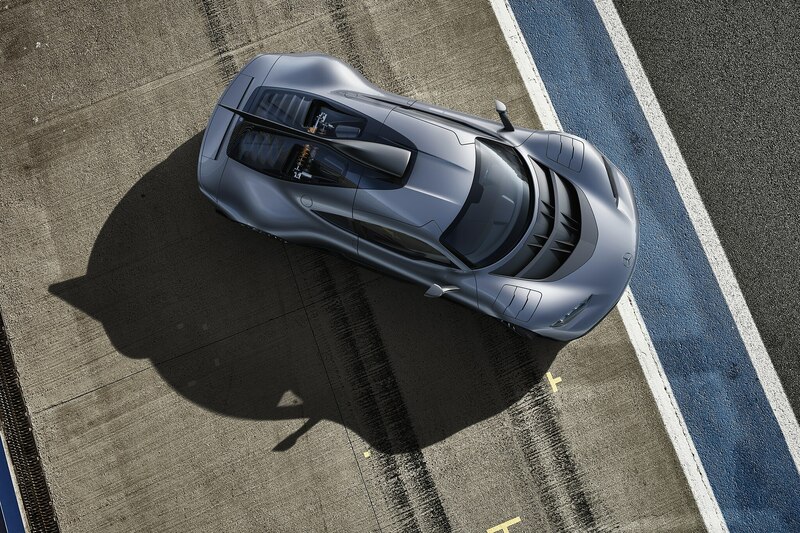 You can’t count the Project One as having 625 horsepower per liter because some of those horsies come from the four-motor hybrid system. But with a mid-engine F1 powerplant under the rear hood, you have to realize it’s not all about straight-line performance. 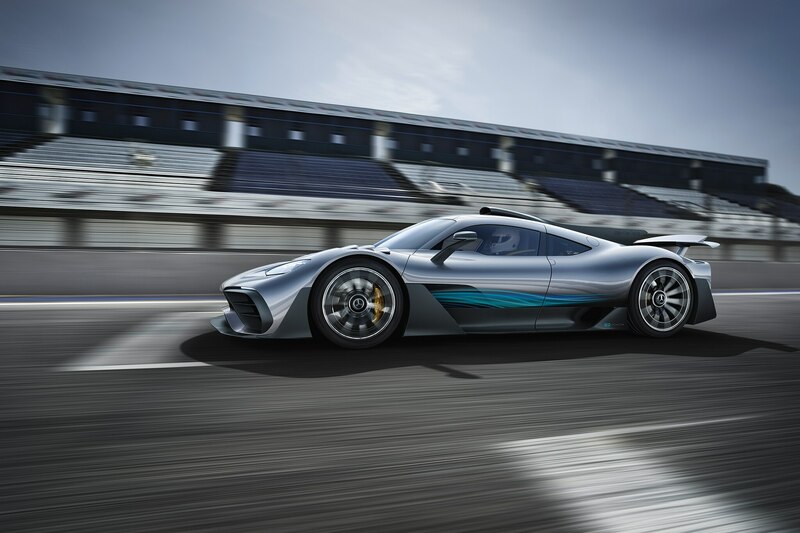 AMG says top speed is 217 mph, which sounds suspiciously close to the top speeds Lewis Hamilton hits on the fastest circuits in the series. 2. It may have an F1 powertrain, but its chassis is street-wise. 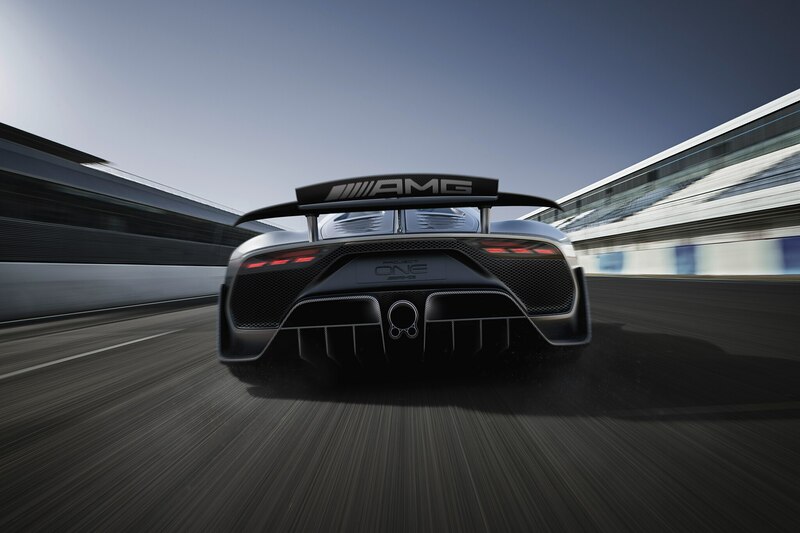 The mostly carbon-fiber body isn’t like an open-wheel, open-top F1 car, and the suspension is different, too, though Mercedes-AMG sourced a lot of the same suppliers, including Multimatic for its “roll and heave” pushrods, which stand in for anti-roll bars by countering each other under lateral force. 3. Project One has its own kind of DRS. 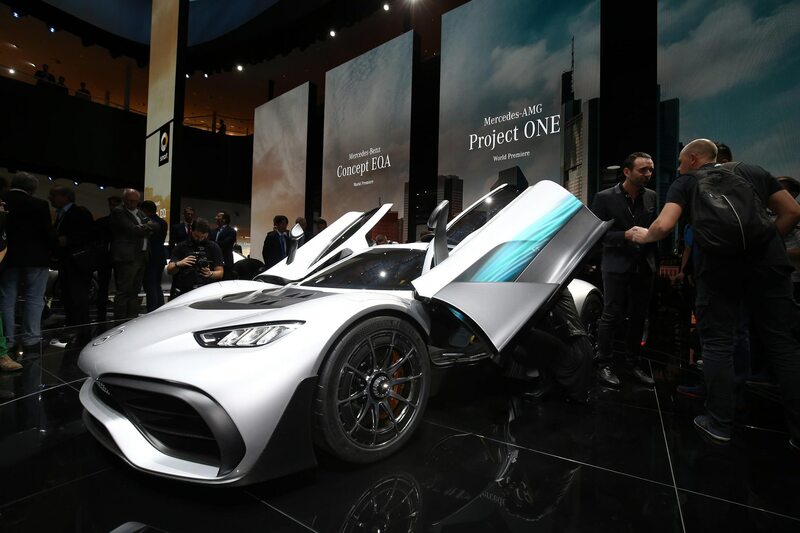 For full downforce in the corners, Project One lowers its suspension and two-piece rear wing flips up to the level of that crazy F1-style sharkfin wing. Also, those three flaps on top of each front fender rise up. 4. 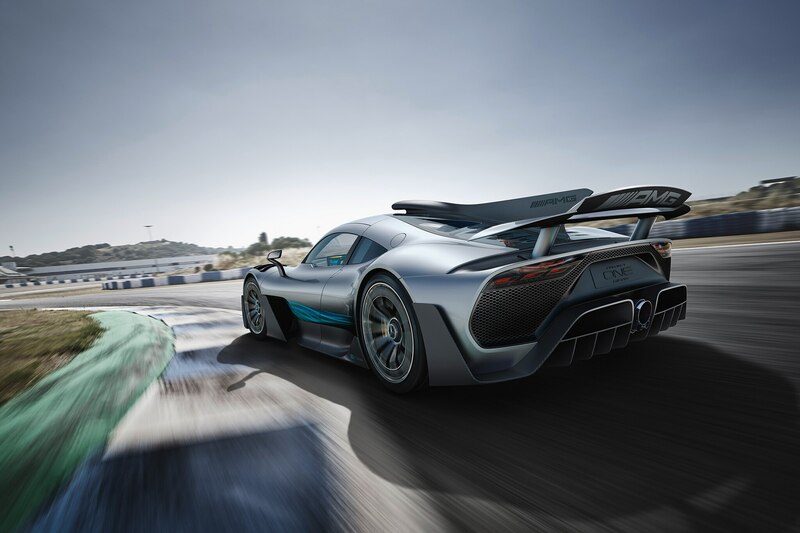 Unlike the race engine, the Project One’s W08 engine is built for more than a few races—or even a season. Colin Chapman once described the perfect race engine for his Formula 1 Lotus cars as one that would blow itself up as soon as his car took the checkered flag. Modern F1 engines are much more reliable, but as built for the track, even the W08’s hybrid V-6 wouldn’t last very long in a street customer’s hands. 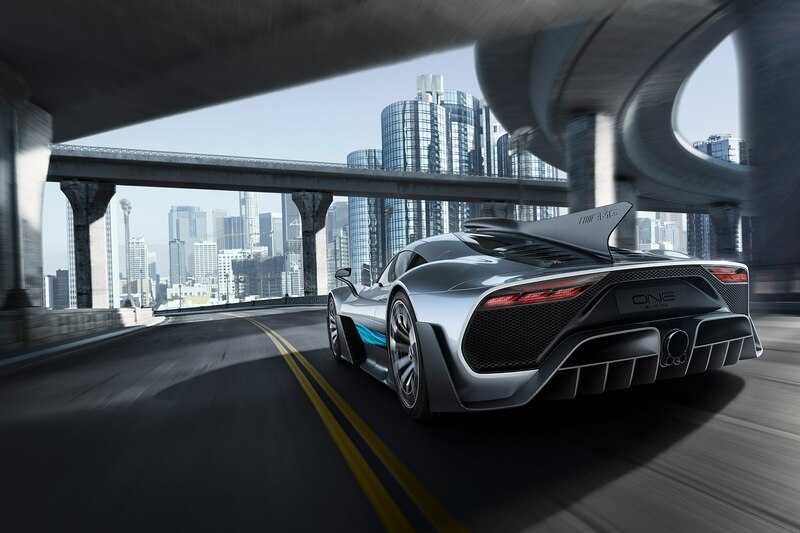 While certain components of the Project One hybrid V-6 are built to be more robust, they’re not necessarily heavier. 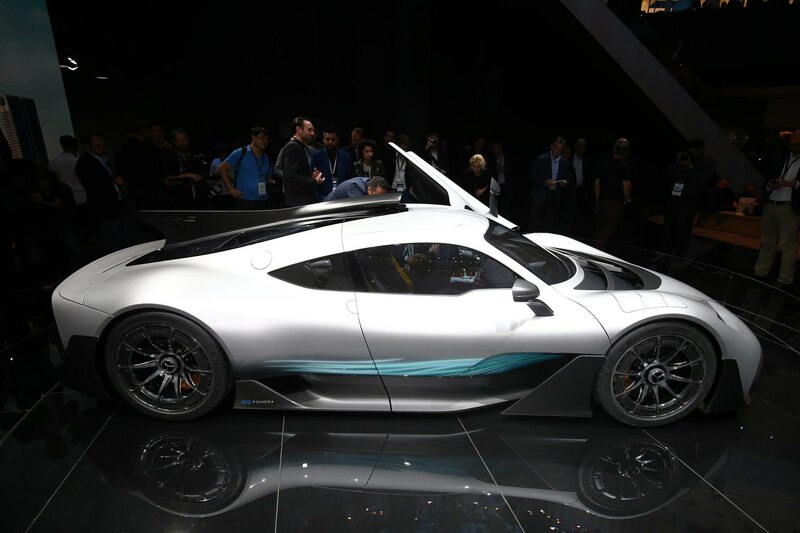 First, remove the batteries, as the Mercedes-AMG Project One has four packs to power its four motors, while the Mercedes-AMG W08 has just one. 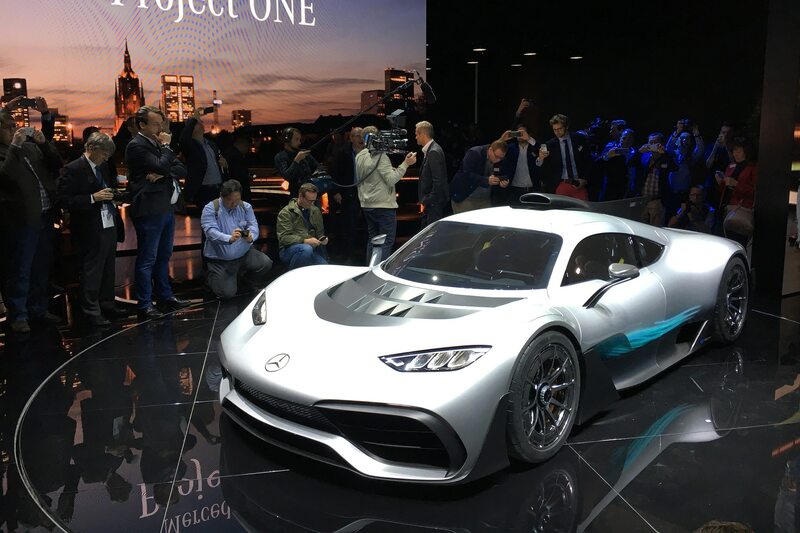 Once you take disparate battery needs out of the equation, Project One’s engine weighs about the same as W08’s, says Rene’ Wollmann, project engineer, though he declines to reveal what that number is. Wollmann also declines to reveal how much the entire Project One weighs. There’s time for some final tweaking. “We have to save something for next year,” and its press conference, he says. But Wollmann assures us that when the car’s weight is revealed, we’ll be pleasantly surprised. 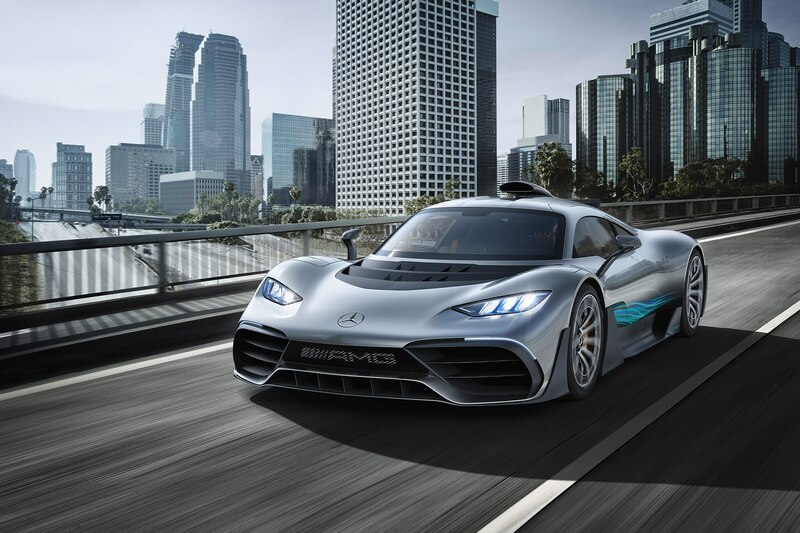 Like other Mercedes-AMG models (and indeed, most Benzes), Project One will offer four drive modes, plus an EV mode—you’ll be able to reserve about 15.5-miles of pure-electric driving for the city center. As for other drive modes, Wollmann says the nomenclature is still under discussion. 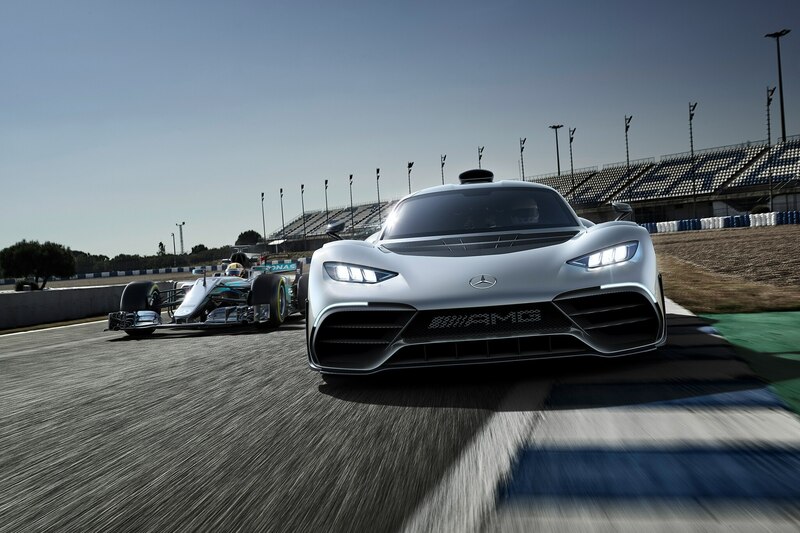 There will be a “kind of” qualifying mode, he says, that will take advantage of the battery reserve for full-power to supplement the turbo V-6, and there will be a race mode with hybrid assistance. 6. Carbon ceramic brakes are standard, of course. Carbon ceramics provide superior stopping distances while thriving on heat. They have no advantage or disadvantage in aiding the brake regeneration system. 7. About that air intake. 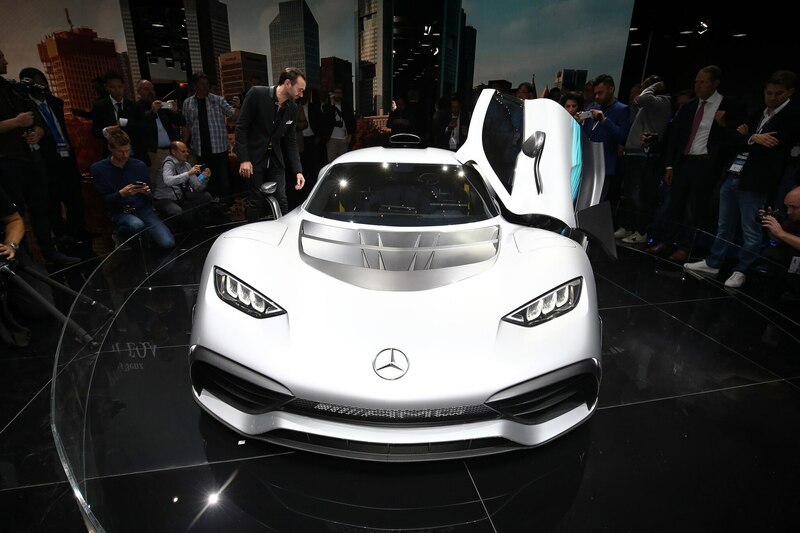 AMG engineers are still tweaking the shape of the air intake on the Project One’s top to maximize its effect on the engine. 8. Design emphasizes function over form. 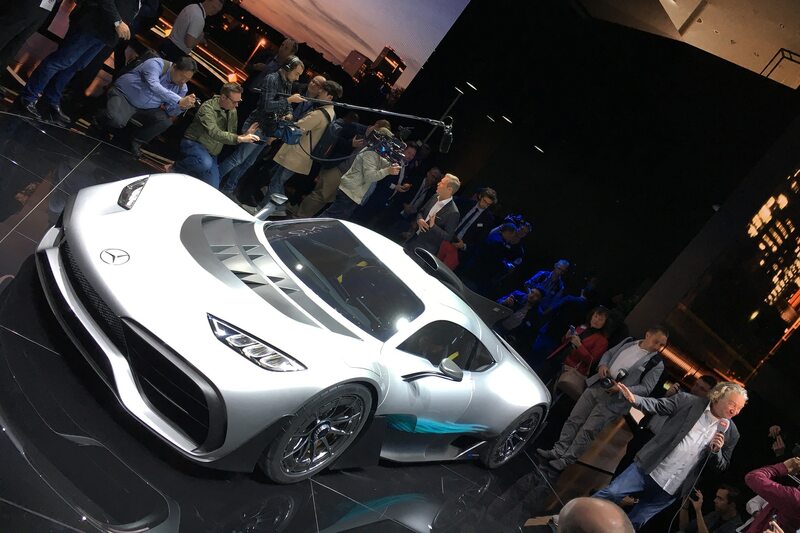 The Mercedes-AMG Project One will not be the prettiest car on the road by any means, though the same could be said for most modern racing cars. 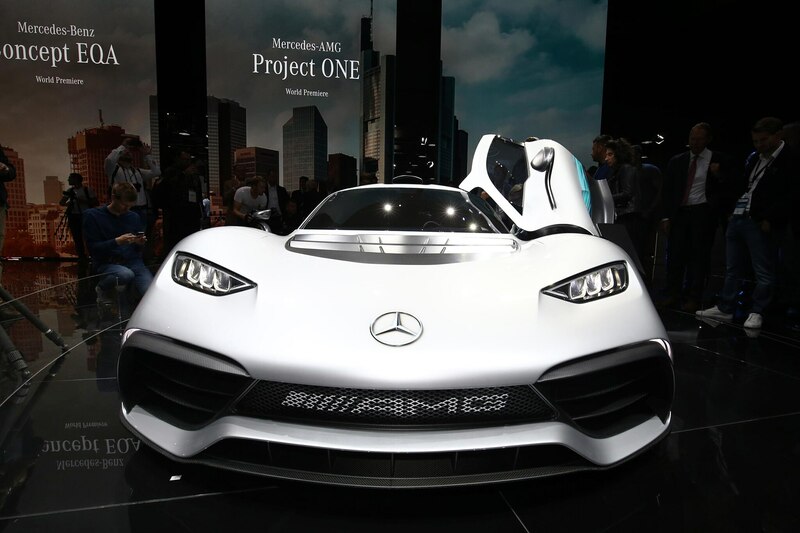 Project One has a purposeful look, and if its lower front fascia reminds you a bit of the McLaren F1 road car’s, well, then that’s probably because the fascia shape works for purposes of speed. Wollmann especially likes the carbon fiber that designers left unpainted, such as the front hood louvers, the lower fascias and the wheel openings. 9. It’s no S-Class inside. The two seats are integrated into the tub shell and allow for just five degrees of seatback adjustment with no fore-aft. 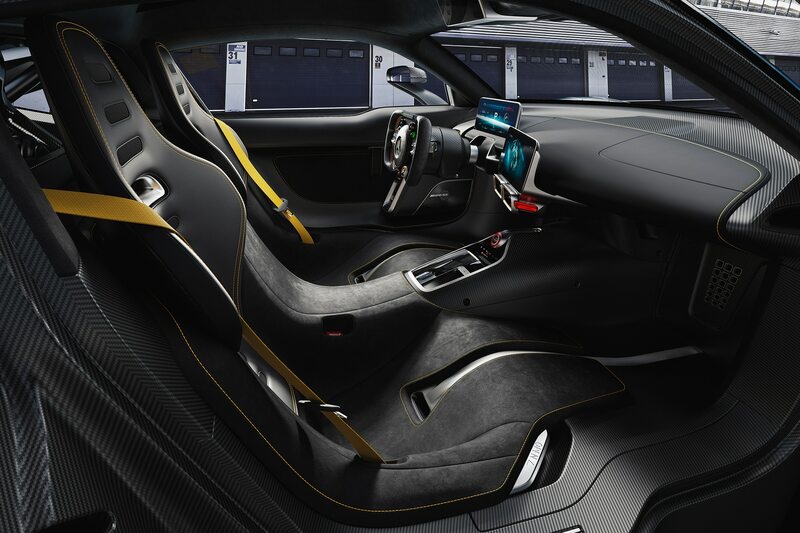 Instead, the steering wheel and the pedals move, “just like a Formula 1 car,” Wollmann says. The F1-style steering wheel also made it possible to place the instrumentation above the wheel, so the driver doesn’t have to look down, away from the road, to see speed or revs, for instance. AMG considered a removable steering wheel, Wollmann says, but one would not have worked with the required driver’s airbag. There’s also an airbag for the passenger, plus plans for two to four more. The car also has catalytic converters and will meet all safety and emissions standards, including for the U.S. 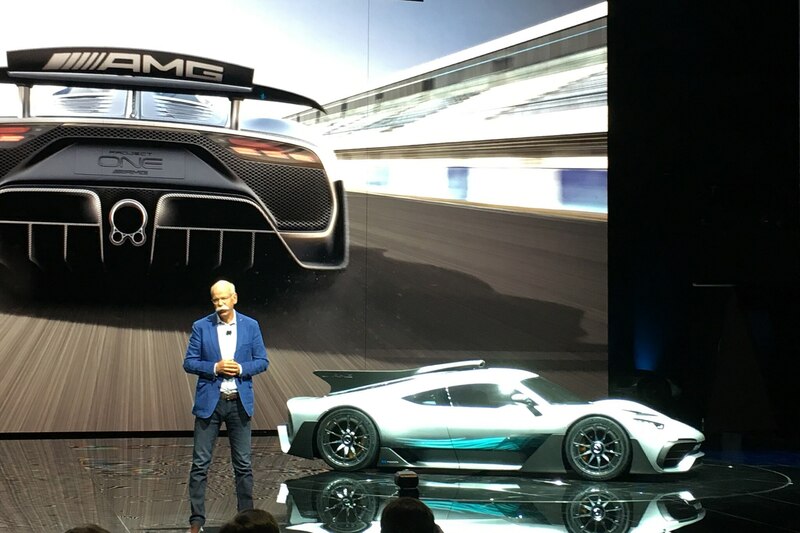 Asked whether he’s driven the car yet, CEO Dieter Zetsche said he hasn’t because interior noise levels from the engine need to be reduced from their current state of 125 decibels, another regulatory no-no. 10. They’re not exactly sold out, but would you like to get on the waiting list? 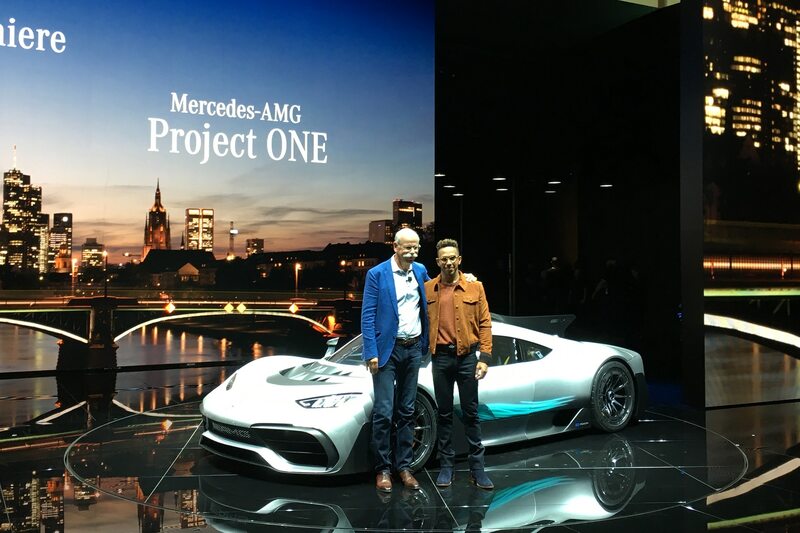 Invites went out to certain loyal Mercedes buyers, some of whom were at the Project One’s unveiling at the 2017 Frankfurt auto show. 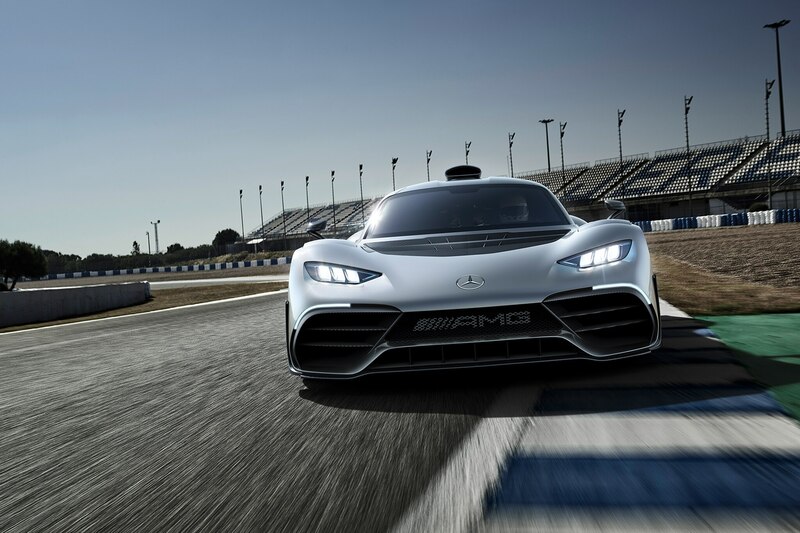 They have plunked down six-figure deposits, and we hear the number of interested potential buyers was about four times the 275 examples Mercedes-AMG intends to build in 2019 and 2020. BONUS FACT: Project One will post a profit. So says Ola Kaellanius, even though F1 engines can easily cost seven figures and even though certain other manufacturers might be willing to take a hit just to celebrate three world championships and to put this sort of car in its showrooms. 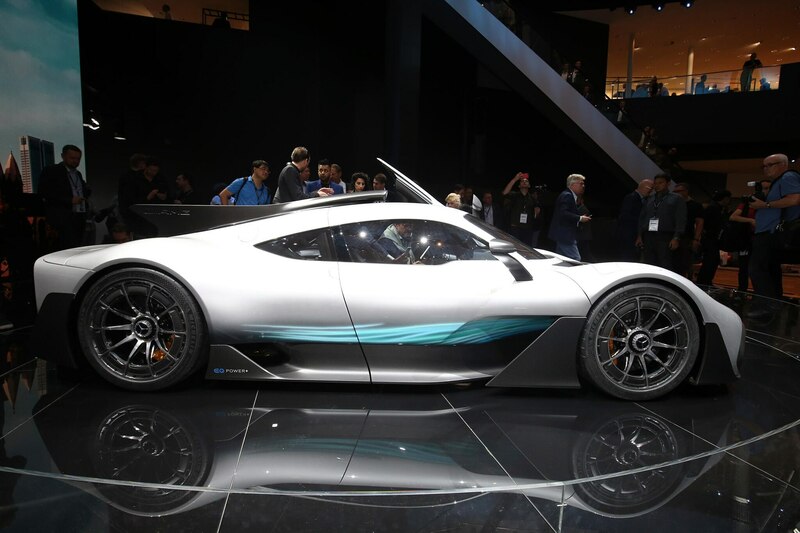 We’ll never learn what its profit margin is, of course, but consider this: at 2.275-million euro, or about $2.53 million each, we figure gross revenues from this car will be roughly equal to that of 12,000 nicely equipped Mercedes-Benz E-Classes.